Our Beyerdynamic tour guide system's Synexis RP8 is a real "mighty mite": it's small and light, but boasts innovative technology and top-quality spoken audio. That's why the Synexis RP8 comes standard with our Beyerdynamic DT 2 headset. Smaller and lighter than a smartphone, the RP8 is perfect for carrying in the pocket of your trousers or jacket. For the busy woman in a "little black dress," the convenient neck/shoulder lanyard holds the receiver securely, even when no pockets are available. Like our Radio-Rental.com team, the folks at Beyerdynamic think easy-to-use equipment is awesome. That's why the pocket receiver not only boasts a channel-lock function (effectively preventing inadvertent channel switching), but also commands smart charging technology and automatic NiMH/alkali battery recognition, helping to prevent malfunction. The Synexis RP8 is a real find for anyone who needs a high-volume tour guide system (for outdoor use, or for tours in loud industrial buildings, for example). 85dB is the legal maximum, corresponding (more or less) to the sound level on the dance floor at an average disco. Result: Intelligible speech, free of distortion and noise. Of course, the RP8 can be turned down, too. Just use the knob on the face of the receiver. While the knob may be on the small side, it can still be operated with gloves on. Our technicians have tested this extensively. Weighing only 90g on its own, with diminutive dimensions of 10.2 cm x 3.7 cm x 6.77 cm (LxWxH), the RP8 can easily hide behind the latest iPhone and fits comfortably in your shirt pocket. Both the lanyard and the convenient belt clip are removable (our staff kindly asks you not to lose them), making the receiver even more pocket-friendly. We think our Synexis tour guide system has the greatest range of any on the market. Analogue transmission (slowly being phased out in favour of digital) is one important reason why. Even with optimal signal transmission, the Synexis RP8 pocket receiver, used in conjunction with a Synexis transmitter (like the Synexis TH8), achieves a range of over 100m. If longer range is desired, we'll be happy to rent you the appropriate repeater equipment. Naturally, the tour guide systems we rent come with headsets at no additional cost. In addition, the RP8 can connect to almost any other headset with a standard 3.55mm jack. The receiver can also connect to induction hearing aids, making the Synexis tour guide system suitable for hearing-aid users. If you're looking for this function, please let us know when renting. The smooth Softtouch surface, unparalleled ease of use, ultra-legible display, battery life up to 12 hours AND, of course, Radio-Rental.com's time-tested Enterprise Service all make the RP8 indispensable for tours, conferences and anywhere interpreting equipment is needed. What situations call for the use of a Synexis tour guide system? Answer: We recommend Synexis technology – and the RP8 in particular – for all situations in the group-tour and presentation fields. This comprises conferences (including those with simultaneous translators) as well as tours in outdoor areas or in manufacturing facilities. The RP8 is ideally suited for these tasks, thanks to its strong volume, top-quality spoken audio and high reception sensitivity. Does the Synexis RP8 need replacement batteries? Not really, because the batteries we supply with the RP8 provide the device with 10 - 12 hours of reliable power, and because the RP8 has a built-in energy-saver function. But if you want replacement batteries, we'll be happy to include some, free of charge. It's always a good idea to have spare batteries. Is the Synexis RP8 easy to use? Yes. Absolutely. Use the two large channel-selector buttons to choose the channel you want. The channel appears on the highly-legible OLED display. The volume knob turns the RP8 on, adjusts its volume and turns the unit off. Activating the channel-lock function prevents the user from switching channels inadvertently. 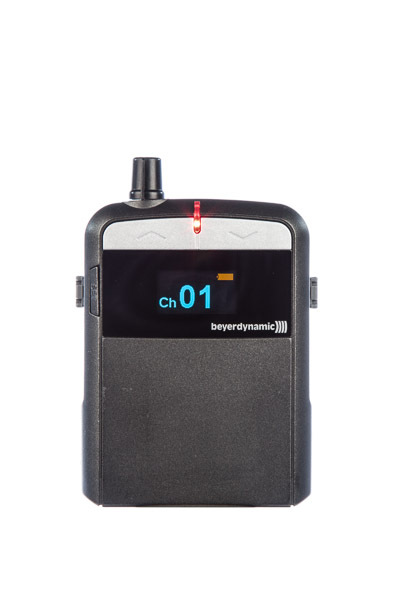 The Synexis RP8's manual is available as a PDF download; please click "Beyerdynamic Synexis RP8 Manual"
How do I charge the Synexis RP8? Just put it into the Beyerdynamic tour guide system's Synexis C30 charging case. The LED indicator shows the current status: Blinking blue = battery charging; solid blue = battery fully charged. Any further questions? Want specific information about whether one of our tour guide systems is right for your intended purpose? E-mail, chat, phone – The Radio-Rental.com team is happy to answer your question anytime; you can rely on our great experience and understanding of every type of use. Range: 100m (and more) when used with the appropriate Synexis transmitter (the TH8, for example). Battery life: Up to 20 hours, according to the manufacturer, although we consider this somewhat unrealistic. Think 10 - 12 hours, to be on the safe side. ...including the Synexis RP8? We're thrilled to hear it. We provide many ways for you to request a knowledgeable, no-obligation quote for our unbeatable value. We look forward to receiving your e-mail at mail@Radio-Rental.com. Or use our chat system (see below left). We're also available by phone, of course, just call 0800/1188440 (or +49 30 29381970).